LONDON--(BUSINESS WIRE)--Market research firm Technavio has announced the release of their latest report on the global steam traps market. This new report will provide expert market insights for the forecast period 2018-2022. The report will follow up on Technavio’s previous report on the global steam traps market, offering an up-to-date analysis of the market concerning the current market scenario, latest trends and drivers, and the overall global environment. The report will also provide new predictions for the forecast period based on an in-depth analysis of the market. The upgraded research report on the global steam traps market 2018-2022 is an integral part of Technavio’s tools and components portfolio. Technavio covers an extensive range of market research reports on the tools and components market, which is growing steadily because of the market demand for cordless tools. Some of the topics include grinding machinery, smart thermostats, professional luminaires, and HVAC air filter. Technavio’s previous report on the global steam traps market projected that APAC was the largest revenue-generating region in the steam traps market in 2015 and is anticipated to continue its dominance. Much of the region’s growth is because of the surging refinery activities and growing demand for thermal power. The high requirement for gasoline across various end-user sectors and the growth of electricity consumption will promote the growth opportunities for steam trap manufacturers in the coming years. Technavio’s new report on the global steam traps market will evaluate the key geographical regions and their behavior over the past four years, introducing new data and observations and providing new predictions. This report is available to order now and will be delivered within one week of purchase. With over 500 specialized analysts, Technavio’s report library consists of more than 10,000 reports and counting, covering 800 technologies, spanning 50 countries. Their client base consists of enterprises of all sizes, including more than 100 Fortune 500 companies. This growing client base relies on Technavio’s comprehensive coverage, extensive research, and actionable market insights to identify opportunities in existing and potential markets and assess their competitive positions within changing market scenarios. 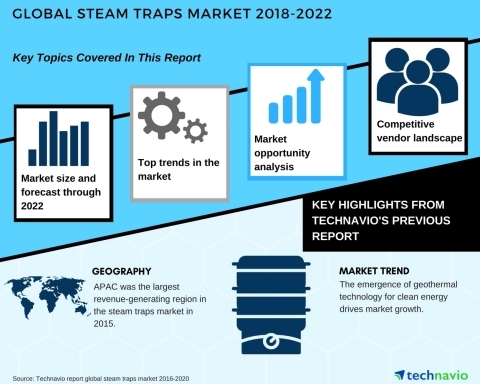 Market research firm Technavio has announced the release of their latest report on the global steam traps market for 2018-2022.